If you’ve done any reading on preeclampsia, we’re probably in agreement that it’s a diagnosis that no woman wants to get. Preeclampsia is a pregnancy complication that affects up to 10% of expecting mamas. It involves high protein levels in the urine and swelling (edema) in addition to high blood pressure. Ultimately, these symptoms can affect blood flow and nutrient transfer to your baby and risk of other complications, including preterm birth. There’s been extensive research into the origins of high blood pressure and preeclampsia and researchers still don’t have perfectly clear answers on how to prevent or treat it. There is more than one cause of high blood pressure and not all cases can be prevented or managed with lifestyle choices, however there are some evidence based lifestyle choices that can help. This article will review 5 research-backed strategies to reduce your risk of preeclampsia. Contrary to conventional advice, reducing your salt intake often does not lower blood pressure and it also does not reduce the risk of preeclampsia. Advice to lower your salt intake is outdated and unfounded advice. A Cochrane review, which is a highly respected source for evidence-based advice, concluded that advice to lower salt intake in pregnancy should no longer be recommended. Salt is vital to many functions in your body and is even more important in pregnancy when electrolyte needs increase (salt is an electrolyte). As early as 1958, in a study of over 2,000 women, researchers noted lower levels of preeclampsia in women who consumed higher levels of salt. In addition, they observed a reduction in blood pressure and edema (swelling) in women when additional salt was added to their diets. In light of this information, these researchers advised women with signs of preeclampsia to “measure out each morning four heaped teaspoonfuls of table salt and to see that by night they had taken all of it.” This resulted in “spontaneous recovery” from preeclampsia (called toxemia in this era) for the majority of the women. They noted that “The extra dose of salt had to be taken up to the time of delivery; otherwise the symptoms of toxemia recurred,” which suggests that salt was indeed playing a crucial role in treating their condition. In short, make sure you are drinking plenty of fluids and liberally salting your foods. 2) Eat a lower-carb, low-glycemic diet. If salt doesn’t raise your blood pressure, what does? It turns out that excessive intake of carbohydrates, especially refined carbohydrates and added sugar, is a primary driver of increased blood pressure. In one study of over 33,000 pregnant women, those who consumed the most added sugars were the most likely to develop preeclampsia. In addition, research has shown that a lower carbohydrate diet tends to reduce the severity of high blood pressure. If you want to lower your chances of developing preeclampsia, it’s wise to be proactive about your food choices and switch to a lower-carb, low-glycemic diet. A low-carb, nutrient-dense diet during pregnancy supports better blood sugar regulation and ensures the optimal development of your baby. This does not mean all carbohydrates need to be eliminated from your diet, just that their intake should be carefully balanced with other foods (such as foods high in protein & fats as well as plenty of vegetables) to minimize spikes in blood sugar. It’s also wise to choose the most nutrient dense carbohydrates (those found in whole foods) while avoiding processed, refined carbohydrates. Carbohydrates that have been “refined” are those that have been processed heavily, most often to remove fiber and/or be turned into flour or starch. For example, whole wheat can be refined into white flour and whole corn can be refined into corn starch. 3) Consume adequate amounts of protein, especially glycine-rich sources of protein. Protein intake is especially important when it comes to maintaining normal blood pressure. Your entire cardiovascular system is under a tremendous amount of stress during pregnancy, as it has to cope with higher levels of fluids, hormonal shifts, and expanding blood vessels. Protein-rich foods supply the raw materials to help your body meet these demands, so it’s no surprise that low protein intake is a risk factor for developing preeclampsia. One amino acid, called glycine, can be especially helpful for regulating blood pressure. Glycine needs increase dramatically during pregnancy. One of the functions of glycine is in the production of elastin, a structural protein that allows your blood vessels to expand and contract. Glycine is also protective against oxidative stress, a hallmark of preeclampsia, and glycine has been shown to reduce blood pressure and blood sugar in studies. Women with preeclampsia excrete less glycine in their urine, suggesting increased demands for glycine and/or depleted maternal stores. The best sources of glycine are the connective tissues, skin, and bones of animal foods, like you consume when you eat bone broth, slow-cooked meat (like pot roast and stews), chicken with the skin, pork cracklings (fried pork skin), and collagen or gelatin powder. 4) Consider supplementing with magnesium. Magnesium deficiency is quite common. In fact, according to recent estimates, 48% of Americans consume inadequate magnesium from food. Magnesium deficiency is even more common during pregnancy, and research has found that magnesium depletion, especially in the presence of calcium excess, can predispose women to vascular complications of pregnancy (such as preeclampsia). Women with gestational diabetes are also commonly deficient in magnesium—and gestational diabetes is linked to a higher risk for developing preeclampsia. Your best food sources of magnesium are seaweed, green leafy vegetables, pumpkin seeds, Brazil nuts, sunflower seeds, sesame seeds, almonds, cashews, chia seeds, avocados, unsweetened cocoa powder (or dark chocolate), bone broth, and green herbs including chives, cilantro, parsley, mint, dill, sage, and basil. You can also absorb a significant amount of magnesium through your skin by taking Epsom salt baths or foot soaks (Epsom salt is magnesium sulfate). 5) Ensure you consume enough choline. Finally, choline is another nutrient that may protect against preeclampsia. It appears that choline plays a role in placental function and may enhance the transfer of nutrients to your baby, a process that’s disrupted in preeclampsia. In both animal and human studies, supplementation with choline reduces placental inflammation and helps prevents preeclampsia. For example, supplementing pregnant women with high amounts of choline in the second and third trimester (930 mg, which is roughly double the current recommended intake) has been shown to improve vascular function of the placenta and “mitigate some of the pathological antecedents of preeclampsia.” Theoretically, this makes a lot of sense. The placenta shares a lot of similar functions to the liver and choline is particularly protective to liver function. Consumption of foods that provide high amounts of choline, namely egg yolks and liver, also supply a variety of micronutrients that are anti-inflammatory. If you’re not already doing so, incorporate these two nutrient-dense foods into your diet. I want to reiterate that although you can do “all the right things” to reduce your chances of complications, sometimes they are out of your control. This advice may stack the deck in your favor, however there is no 100% proven way to avoid any or all complications. If your blood pressure does go up during pregnancy or you get a diagnosis for preeclampsia, its wise to work with an experience medical provider to determine the underlying cause and get you appropriate treatment, which may include lifestyle changes and/or medication. 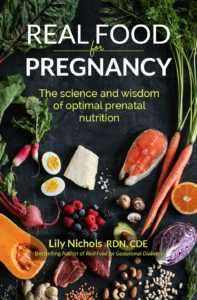 In her latest book – Real Food for Pregnancy – Lily Nichols takes prenatal nutrition advice out of the dark ages and provides an easy-to-follow guide for making the best food and lifestyle choices during pregnancy. In Real Food for Pregnancy, you’ll get clear answers on what to eat and why, with research to back up every recommendation. 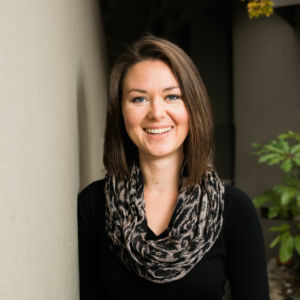 Lily Nichols has taken a long and hard look at the science and lays out the evidence—930 citations and counting—on the benefits of real food, why certain foods are essential (and others are detrimental), and countless lifestyle tweaks you can make to have a smooth, healthy pregnancy. • In Real Food for Pregnancy Lily Nichol’s debunks a LOT of prenatal nutrition myths. Most prenatal nutrition advice is either outdated or not evidenced-based. Misconceptions of conventional prenatal nutrition: macronutrients, salt, “foods to avoid,” fish, etc. • Traditional postpartum care, impact of nutrients on breast milk quality, etc.